On October 3, 1942, the very first vessel constructed by humans, the ‘Aggregat 4‘ (A4) touched outer space. 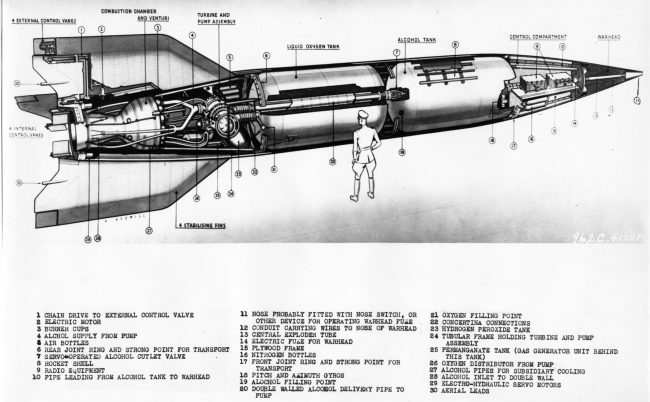 The liquid-propellant rocket was designed to be the world‘s first long-range combat-ballistic missile, but also the first known human artifact to enter outer space. 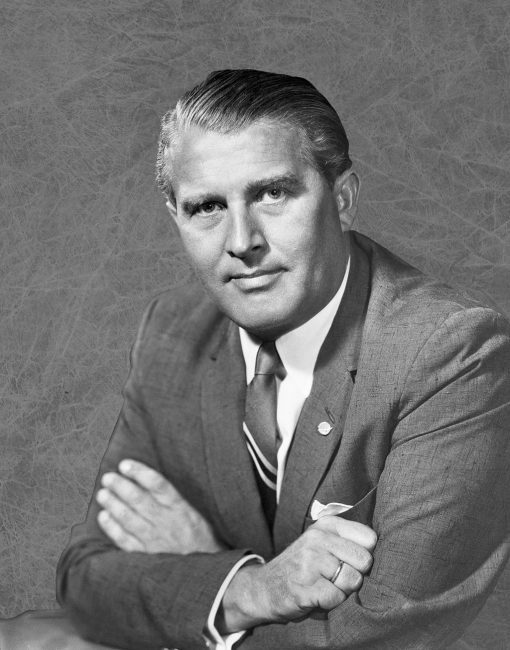 Designer of the A4 was German rocket scientist and space pioneer Wernher von Braun, who was born on March 23, 1912, in Wirsitz (today Wyrzysk), Posen Province, Prussia, Germany (today Poland). Von Braun’s father was the East Prussian landowner and later Reich Minister of Food Magnus Freiherr von Braun. Even as a child, von Braun was interested in music and the natural sciences. His enthusiasm for astronomy was aroused by his mother, who gave him an astronomical telescope as a confirmation. At the age of 13, he experimented with fireworks rockets in Berlin’s Tiergarten. When he got his hands on the book The Rocket to the Planetary Spaces (‘Die Rakete zu den Planetenräumen‘) by Hermann Oberth, the utopias he had taken from the adventure novels by Jules Verne and Kurd Laßwitz attained something real. 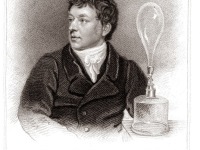 In order to be able to understand the scientific book, he made an effort to improve his mathematical achievements, which had been modest until then. 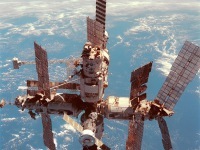 He was also inspired by the Slovenian astronomer and astrophysicist HermanP otočnik‘s book Das Problem der Befahrung des Weltraum (The Problem of Space Travel). From 1928 he attended the newly founded Hermann Lietz High School Spiekeroog. Due to his good performance he was able to take the Abitur examination there prematurely at the age of 18 in April 1930. From 1929 he worked together with Hermann Oberth in Berlin-Plötzensee and with members of the Verein für Raumschiffahrt on the rocket airfield Berlin in Reinickendorf on rockets with liquid engines. In 1926 Robert Goddard had already successfully launched a liquid rocket. Von Braun studied from 1930 at the Technical University in Berlin-Charlottenburg and at the ETH Zurich. In 1932 he obtained a diploma as an engineer for mechanics at the TH Berlin and, supported by Walter Dornberger, joined the rocket program of the Army Weapons Office as a civilian employee. He carried out his experiments on the grounds of the Kummersdorf Army Experimental Station about 30 kilometres south of Berlin. 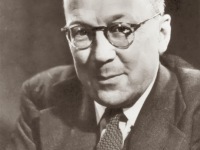 In 1934 he received his doctorate at the Friedrich-Wilhelms-Universität in Berlin with a thesis on “Constructive, theoretical and experimental contributions to the problem of the liquid rocket“. In the same year, Aggregate 2, designed by von Braun and launched from the North Sea island of Borkum, reached an altitude of 2200 metres. In the following years, the German scientists kept collecting the essential knowledge and technologies to construct the A4. In 1941 the four key technologies turned out to be large liquid-fuel rocket engines, supersonic aerodynamics, gyroscopic guidance, as well as rudders in jet control. Adolf Hitler was really pushing the construction of the A4, in need of a ‘wonder weapon‘ to scare off the enemies as well as to use it as a Propaganda ‘tool‘ for the German citizens. Aggregat 4 was developed in 1939 and first tested in March 1942. On October 3, 1942, it was successfully launched at a top speed of almost Mach 5 (4824 km/h), reaching a maximum altitude of 84.5 km, thus entering the border zone with space for the first time. This was the first successful large rocket launch in the history of mankind. On 20 June 1944, a vertical launch achieved a height of 174.6 km; the rocket thus clearly exceeded today’s recognised space limit of 100 km and was the first human object to float in space orbit. In August of 1944, Hitler announced the V-2 attacks to begin very soon and in early September the first rocket was launched at Paris. For propaganda reasons, the oficcial name of Aggregate 4 became “V-2” (Vergeltungswaffe 2, i.e. retaliation weapon 2). The rocket‘s target was mainly London and later Antwerp, causing huge damages and thousands of deaths. In 2010, scientists reconstructed the V-2, finding out that its detonation creates a 20 m wide and 8 m deep crater, throwing up 3000 tons of material in the air. The A4 rocket was 14 meters high and had a mass of 13.5 tons. The single-stage rocket consisted of about 20,000 individual parts. The fuselage consisted of frames and stringers covered with thin sheet steel. The technology consisted of four assemblies: (1) the tip with warhead and impact fuse; (2) the device part with batteries and gyro control; (3) the middle part with tanks for ethanol and liquid oxygen, and (4) the rear part with thrust frame, pressure bottles with nitrogen, steam generator, turbopump, combustion chamber (“furnace”), thrust nozzle, jet rudder and air rudder. Aggregate 4 was a liquid rocket powered by a mixture of 75 percent ethanol and liquid oxygen. After a burning time of about 60 seconds, the rocket reached its maximum speed of about 5500 km/h, about Mach 5. The combustion gases left the kiln (rocket engine) at about 2000 m/s. The entire flight was completed by the rocket’s first combustion. Since the entire flight lasted only 5 minutes at a range of 250 to 300 km, there was no defence against this weapon at that time. During the Second World War, a total of 5975 rockets were assembled from thousands of individual parts by forced laborers, concentration camp prisoners and German civilian workers. After the war, it was mainly the United States, but also the USSR who tried to gather as much V-2 material as well as staff as they could. On May 2, 1945, Wernher von Braun joined the armed forces of the United States and, together with other scientists from his staff, was also brought to the United States (Operation Paperclip). The United States began their first space exploration programs with the V-2. 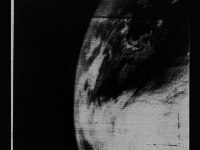 In 1946, the U.S. Military was able to take the first picture from space with the V-2. In Huntsville (Alabama), the Redstone Arsenal was founded as the first centre for missile development, where a total of 67 A4 missiles were launched together with German scientists. They formed the basis for the later Redstone rockets and for various further developments of similar war weapons, but ultimately also for the Saturn V rockets. At yovisto academic video search you can watch original footage from the ‘Heeresversuchsanstalt Peenemünde’ that documented the state of development of the A4 in October 1942.